525 pages | 93 B/W Illus. 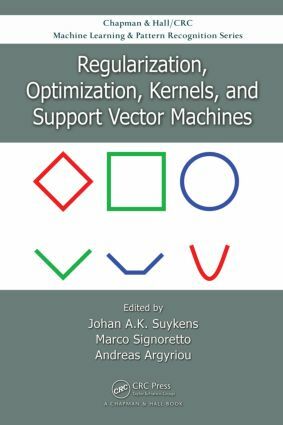 Regularization, Optimization, Kernels, and Support Vector Machines is ideal for researchers in machine learning, pattern recognition, data mining, signal processing, statistical learning, and related areas. Johan A.K. Suykens is a professor at Katholieke Universiteit Leuven, Belgium, where he obtained a degree in electro-mechanical engineering and a Ph.D in applied sciences. He has been a visiting postdoctoral researcher at the University of California, Berkeley, USA, and a postdoctoral researcher with the Fonds Wetenschappelijk Onderzoek - Vlaanderen, Belgium. A senior IEEE member, he has co/authored and edited several books; received many prestigious awards; directed, co/organized, and co/chaired numerous international conferences; and served as associate editor for the IEEE Transactions on Circuits and Systems and the IEEE Transactions on Neural Networks. Marco Signoretto is currently a visiting lecturer at the Centre for Computational Statistics and Machine Learning (CSML), University College London, UK, in the framework of a postdoctoral fellowship with the Belgian Fund for Scientific Research (FWO). He holds a Ph.D in mathematical engineering from Katholieke Universiteit Leuven, Belgium; a degree in electronic engineering (Laurea Magistralis) from the University of Padova, Italy; and an M.Sc in methods for management of complex systems from the University of Pavia, Italy. His research interests include practical and theoretical aspects of mathematical modeling of structured data, with special focus on multivariate time-series, networks, and dynamical systems. His current work deals with methods based on (convex) optimization, structure-inducing penalties, and spectral regularization. Andreas Argyriou has received degrees in computer science from the Massachusetts Institute of Technology, Cambridge, USA, and a Ph.D in computer science from University College London (UCL), UK. The topic of his Ph.D work has been on machine learning methodologies integrating multiple tasks and data sources. He has held postdoctoral and research faculty positions at UCL; Toyota Technological Institute at Chicago, Illinois, USA; and Katholieke Universiteit Leuven, Belgium. He is currently serving an RBUCE-UP fellowship at École Centrale Paris, France. His current interests are in the areas of kernel methods, multitask learning, compressed sensing, and convex optimization methods.